An infection is the most common problem affecting the ears, especially in the children. 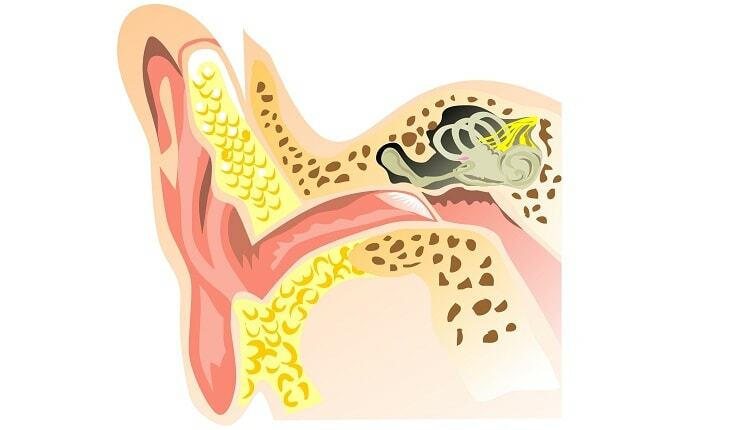 Ear infections usually affect the middle and outer ear and can occur due bacteria or viruses. The infections in the middle ears are usually due to bacteria while the infections in the outer ear are usually due to the growth of fungi caused by the moisture in the ears. The factors that can contribute to ear infections include wax build-up, food allergies, upper respiratory tract infections, environmental allergies, genetics, fetal alcohol syndrome, internal injuries, and nutritional deficiencies. The common signs and symptoms of ear infections are pain in the ears, a tugging sensation at the ear, difficulty in sleeping, poor response to a sound, headache, discharge from the ear, high fever, and vomiting. Salt is the most readily available home remedy for treating ear infections. The warm sea salt possesses antiseptic properties, which help to take care of the infection. It also helps to remove moisture from the ears that could be the cause of fungal infections. In addition, applying heated salt imparts warmth on the affected part, which helps to draw out the abnormal discharge from the ears and relieve the pain and swelling. Heat one cup of salt in a pan for a few minutes. Alternatively, you may heat it in a double boiler or microwave. Then, place the salt on a cloth and make a bundle of it by rolling the cloth. Make sure the open ends of the cloth are sealed with a rubber band or tied in a knot. You can also put the salt in a sock and tie a knot at its open end. It is advisable to use a thick cotton sock to avoid burning your skin. Lie down and put this cloth or the sock on the ear for about 5 minutes. You can repeat this remedy every day as many times as needed till the infection clears up completely and the pain is subsided. Before placing the cloth on the ears, touch it and make sure the heat is bearable. If the cloth feels too hot, wait for some time to prevent damaging the skin of ears. If you are using a microwave to heat the salt, there is a possibility of the salt getting heated up unevenly and too fast. In addition, heating of the same sock repeatedly in the microwave can increase the chances of the sock catching fire or the salt melting. Hence, avoid using the same sock for several days. Also, heat the salt in 5-second increments and shake it up until the desired temperature is attained. Garlic is a strong natural antimicrobial agent. Recent research conducted at the Washington State University has found that garlic is almost 100 times more effective at killing bacterial strains than two commonly used antibiotics. Though the study was related to the infections that led to food borne illnesses, it definitely proved the effectiveness of garlic in controlling bacterial infections. Garlic has also been shown to act against some viruses. Garlic possesses natural pain-relieving properties. These actions of garlic make it a perfect remedy for the treatment of ear infections. It can directly destroy the bacteria thus clearing up the infection. It also produces an anti-inflammatory action that helps to reduce swelling and pus formation in the ears. It results in a reduction in the pressure in the ears caused due to the accumulated pus thereby providing relief from ear pains. In addition, Garlic contains alliinase and alliin, both of which combine to form allicin when a clove is crushed or chopped. This compound has soothing properties, which can provide a considerable relief from the ear pain. The best form of garlic for treating ear infections is its oil. You can prepare the oil by boiling on a low flame two to three garlic cloves in 2 tablespoonfuls of mustard oil or sesame oil till the garlic cloves become soft and tender. Then, strain the solution and allow it to cool just a bit until it is safe and bearable to apply to the skin. Put in two to three drops of the oil in the affected ear just as you put in the eardrops. You should use a clean dropper for the purpose. An alternative way to use garlic for ear infections is to boil two to three garlic cloves in half a cup of water for about five to ten minutes until the cloves are cooked or become soft. Then, drain out the water and keep the pulp. Then, crush the pulp and add to it a pinch of salt. Put this mixture in a cloth and place it on the affected ear. Additionally, you can also consume two to three cloves of garlic every day to speed up the healing. Holy basil can help in the treatment of ear infections in a variety of ways. It produces an antibacterial action and kills the bacteria. It is effective against a wide range of Gram-negative and Gram-positive bacteria. Eugenol, a compound present in holy basil, acts as an antimicrobial agent, which works well against a range of infective germs. It also reduces pain and irritation in the ears when used locally or consumed orally. Treatment with holy basil is particularly beneficial for the patients with diabetes as it has the ability to control the blood glucose levels. Ear infections, especially those caused by fungi, are more common in the diabetic patients as the uncontrolled levels of blood sugar produce a favourable environment for the fungi to grow. The anti-diabetic activity of holy basil helps to control the blood sugar levels and thus, reduce the frequency of ear infections. It also prevents the flaring up of the existing infections by lowering blood sugar levels thereby creating an unfavourable environment for the organisms to grow. Holy basil can also be used in case of severe ear infections that cause systemic symptoms like fever. It reduces fever with its antipyretic and anti-inflammatory properties, and restores the health quickly. The components of basil such as camphene, cineole, and eugenol provide relief from the congestion and swelling in the ears. Crush gently about four to five holy basil leaves to extract the juice. Then, apply the juice on and around the affected ear. Make sure the juice does not enter the ear canal. You can also use holy basil oil for treating ear infections. Mix a few drops of basil oil in an equal amount of carrier oil such as coconut oil. Dip a clean cotton ball in this mixture and use it to wipe the inside of the ear gently. Also, swipe the cotton ball behind and around the outer edge of the ear. Repeat this twice daily until the infection is relieved completely. Apple cider vinegar is a potent antifungal agent. It is particularly useful in the treatment of infections in the outer ear. The outer ear infections are usually caused by fungi and lead to symptoms like pain and a bubble-like sound in the ears. Fungal infections also cause a newspaper pulp-like discharge from the ear. Patients suffering from these symptoms should use apple cider vinegar to get rid of the infection. It destroys the fungi and reduces swelling, pain and discharge in the ears. Apple cider vinegar also produces a decongesting action and helps to open up the Eustachian tube, thus allowing it to drain. Mix half a cup of apple cider vinegar in an equal quantity of water or alcohol. Then, dip a clean cotton swab in this solution. Put the cotton swab in the ear just like an earplug and leave it for five to ten minutes. Remove the cotton swab and turn to lie down on the opposite side to allow the liquid from the infected ear to drain out. You can use white vinegar in place of apple cider vinegar in the same way. If the symptoms are accompanied by soreness in the throat, the infection has spread likelihood to the Eustachian tube. To clear up this infection, gargle with apple cider vinegar. Olive oil contains antibacterial and anti-fungal properties that help in clearing up the infection in the ears. In addition, a build-up of wax is the main cause of ear infections. Olive oil can help in clearing the wax build up thus tackling the root cause of the condition. The wax can also increase the risk of fungal and bacterial growth and lead to blockages in the Eustachian tubes. Olive oil can also help to clear the obstruction and prevent the spread of infection in the Eustachian tubes. Olive oil can cause the wax to soften and help you remove it easily with a cotton-tipped swab. Warm 2 – 3 teaspoonful of olive oil slightly. Then, put a few drops of this oil into the ear. Lie down in the position for 10 minutes and then, clean the ear with a clean cotton-tipped swab. While removing the wax, be careful and avoid putting the swab too deep into the ear as it may damage the eardrum and result in loss of hearing. Application of heat over the affected ear helps to prevent the pain. It also causes an increase in the blood circulation thus allowing for an influx of immune cells to the infected ear, which helps these infection-fighting cells to destroy the bacteria more effectively. It also prevents the growth of infective organisms. The warmth created by the heating pad helps to reduce swelling and allows for the drainage of pus. Simply press a heating pad against the infected ear for about 5 minutes. You can do this as many times as possible to reduce the pain and swelling. You may also use a warm compress. Just dip a clean cloth in hot water, squeeze out the excess water and place it on the ear. Alternatively, you can use a warm water bottle, if you do not have a heating pad. Make sure the heating pad is not too hot. Also, do not apply heat for long periods. Begin with five minutes, remove the pad for a while and then, place it again on the ear. Repeat the process as needed. Mullein oil possesses antibacterial and anti-inflammatory properties. It helps to destroy the bacteria responsible for the infection and reduces pain and swelling by controlling inflammation. Take one or two teaspoonfuls of mullein flowers and put them into half a cup of boiling water. Let the water cool down and then, mix one tablespoon of olive oil and one tablespoon of mullein tea into it. Allow the mixture to stay for overnight. In the morning, put in one drop of the mixture into the ear. You can use it three to four times a day until the infection subsides. You may warm the oil in the morning before putting in the drops as the warmth helps to reduce the pain. The warmth of onions can provide comfort by producing a soothing action. It also assists in improving the blood circulation. Onion is also believed to possess antibacterial, antifungal, and antiviral properties, which help in clearing up the ear infections. Onions also allow the drainage of pus and lymphatic fluid thus easing the discomfort caused by earaches. You can use one yellow or brown onion and cut it into 2 halves. Bake both the halves on the oven rack by keeping them face down until you can smell the onion. Then, remove it from the oven and allow cooling down a bit just enough to avoid causing burns to the skin of the ears. Lie down on your back with your head supported by a pillow. Then, place the baked onion over the ears just like the earmuffs, and wrap them using a cloth. Use a 100% wool scarf or 100% cotton towel as the chemical fumes coming by the heating of an acrylic fabric can go into the ear canal and cause damage. Wrap the top of the head also to ensure the onions are completely covered. Keep it sealed by wrapping the cloth loosely around the neck. Leave it on for about 10 to 15 minutes. Repeat as many times as needed. Tea tree oil acts as an antibacterial agent and helps to get rid of the infective organisms. It also possesses healing properties, which help to speed up the recovery. Tea tree oil can also provide relief from pain. Prepare a mixture of 3 drops of tea tree oil, one tablespoon of apple cider vinegar, 2 tablespoonfuls of olive oil, and one teaspoonful of colloidal silver. Then, place your head on a towel, such that the infected ear is facing upwards. With the help of a dropper, put in 2 to 3 drops of this mixture into the infected ear, and leave it for five to ten minutes. Turn your head and allow the mixture to drain out completely. Follow this for three to four times a day for better results. Massaging with essential oils can help dilate the blood vessels and thus, increase the blood supply to the infected part. This helps in the clearing up of the infection. Essential oils are also soothing for the ears and help to relieve pain and swelling. It also facilitates the drainage of pus from the ears. You can use eucalyptus, lavender, rosemary, oregano, thyme, and chamomile oils for this purpose. The oils must be diluted before using them for massage. Take a few drops of the diluted essential oil and use it to massage the area around the ears and the neck in a downward direction. Apply gentle pressure from the front of the ears towards the cheeks. Do this 3 to 4 times a day to get relief from the symptoms. Though there are several antibiotic and antifungal tablets and eardrops, which can help in treating ear infections; most of them are known to cause side effects. In addition, an oral intake of some antibiotics is not recommended for the pregnant and breastfeeding women and those suffering from a kidney or hepatic disorder. Hence, it is advisable to use these simple home remedies to tackle the infection. These medicines are safe even for children and pregnant and breastfeeding mothers. These remedies are highly effective in treating ear infections and relieve the symptoms caused by the condition.